Beyond letter recognition, sound association, isolating and blending, teaching children how to read our complex English language can be a daunting task. Where does one even begin to teach children the rules and regulations that are associated with reading? For instance, while teaching reading throughout my career, many times I have found myself wondering or outwardly saying to my students, “I don’t know why they used a ‘ph’ in that word instead of an ‘f’,” or, “I realize those letters are ‘augh’ but they actually make the short ‘o’ sound together like in the word ‘taught’ but they say the short ‘a’ and ‘f’ sound like in the word ‘laugh.” Phew! This kind of confusion applies to many words in our language. Understanding and familiarizing yourself with the 7 syllable types can greatly ease the teaching process. Once your child, or student, is familiar with them, they can be referenced at any time when attempting to decode words. Picture this syllable type as a door that is shut. It is a syllable in which a vowel is followed by a consonant. In that case, the vowel usually makes the short sound. This syllable type can be thought of as a door that is open. Any syllable that ends in a vowel, the vowel is almost always long. Essentially, this is a syllable that has a long vowel, followed by a consonant, and then a silent e. This is a fun one because it requires me to do a little role playing. To explain the concept to children, I talk in a little old lady voice, wave my finger at them as if I were the “mama E” at the end of the word and the vowel was my child. I say in my old voice, “vowel, you say your name!” And then I tell them that is Mama E’s only job…she makes the vowel say their name (or make their long sound) and then she is quiet after they listen to her. I remember when I was learning how to read, I was taught, “two vowels go walking, the first one does that talking.” That is the idea behind the Vowel Team, though that rule doesn’t apply to every situation. Really, the rule is that a syllable that has 2 vowels next to each other make one sound when combined. A syllable in which a vowel that is in front of a single “r” is then “controlled” by that r.
This is a syllable where, when two vowels are combined, form a new vowel sound. An “le” appears at the end of a word with a consonant. Building a strong foundation in reading is key to developing fluency. In addition to learning the 7 syllable types, reading with an adult daily for at least 10-15 minutes is greatly beneficial and will transfer across all subject areas. The latest philosophical shift towards designing curriculum that supports STEAM (Science, Technology, Engineering and Mathematics) in the classroom is creating a generation of students who are able to work collaboratively and innovatively in the workforce. The purpose behind the focus on STEAM is to cultivate our future society’s ability to innovate and to boost the economy that will eventually be lead by the children of today. STEAM activities are being incorporated into schools across the nation in grades as early as pre-kindergarten and throughout high school. What used to be known only as STEM, it has been modified into STEAM in order to include the very important Arts and Design element. The idea of the importance of incorporating the Arts into this movement can be much attributed to Daniel Pink’s New York Times’ and BusinessWeek’s bestseller book, A Whole New Mind, where Pink discusses “why right-brainers will rule the future” as our society “shifts from the left-brain dominated Information age” towards one created by design and innovation. Still, while right-brained children will greatly impact our future, it is still essential to cultivate our left-brained students who will lead the way in the other areas of science, technology, engineering and mathematics. Education Closet’s Steam Portal is a website that offers ideas for lessons and other resources for support and information. Students can compete with teams nationally and across all grade levels through Odyssey of the Mind. Teams are challenged with complex problems that will require creative thinking in order to solve. DIY is a forum that allows students to explore their own skills and share them with others. From art to philosophy to business-related skills, there is a place for everyone. Digital STEAM Workshop from Autodesk provides projects created by field experts in an effort to support project-based learning. Students can choose from a plethora of project challenges and can also choose between beginning, intermediate and advanced levels to best meet their learning needs. The Center for Innovation in Engineering and Science Education is another great resource for project ideas that support STEM. KinderArt provides a multitude of art lessons and is sorted by age and by medium. It provides project ideas, art history lessons, vocabulary, filler activities and so much more! The flipped classroom was created in 2007, when teachers Jonathan Bergman and Aaron Sams needed a solution to the problem of how to deliver content taught during the day to the students who were absent from school. They began utilizing software that recorded their PowerPoint presentations and shared them with those absent students. This idea became very popular among other teachers and eventually lead to the flipped classroom. -Teachers have the availability during the day to personally work with students to explain concepts that are challenging to them. -Students are more likely to watch online videos at home than they are to complete assigned homework that they feel is too difficult. -Studies on the concept of the flipped classroom show that students have greater success in the areas of math and english when compared to students in a traditional classroom setting. -Students arrive to the classroom with prior knowledge and a familiarity with the topic that will be addressed that day. Problem: Students may have limited or no access to the internet at home. Solution: Students can remain at school after the school day and utilize the internet or students can visit the public library. Problem: Recorded lectures mean that students cannot ask for clarification during the lesson. Solution: Teachers can encourage students to write their questions down and can address them individually the following day. Problem: Determining how to address students who consistently need to view the lectures at home. Solution: Students need to be held accountable for watching the lessons just as they would for completing their homework assignments. Teachers can utilize software that keeps track of who views the lectures in their entirety. Post written by Lauren Bronson from Tampa Learning Co.
Executive Functioning skills are skills needed to take a task from beginning to the end. With a child,this could be as simple as cleaning up they room, finishing a chapter book, responding to a question in class or remembering to take their lunchbox home. Easy, right? Sometimes yes, but often these tasks that seem automatic to adults are difficult for children. This does not mean the child is lazy or careless. This could mean that the area of their brain that works on the particular area of executive functioning is not fully developed yet. Let’s take a quick moment to think about a child’s brain. Most executive functioning tasks happen in the frontal lobe. There are a few times in a child’s life when there is rapid growth and brain development. There is a time right around the age of eleven or twelve that the brain goes through a stage that there is great growth in grey matter, made of up neurons, never sells and synapse, in the brain. Right after the growth of grey matter, there is a time of pruning. This time in a child’s education and life are crucial for brain development and executive functioning skills. The “use it or lose it” phrase can be applied here. Since the frontal lobe is still developing during the pre-teen years, it is important for children to use this area of the brain to practice their executive functioning skills. The practice not only allows the student to learn important skills such as time management and organization, but it also allows their brain to make deeper connections. Did you know that your pre-frontal cortex isn’t fully developed until you are in your early twenties? No wonder so many children and teenagers struggle with decision making, planning and impulse control! It is our job as educators and parents to fill in as their frontal lobes while their own frontal lobes are still developing. Want to learn more about Executive Functioning? I highly recommend Peg Dawson’s book, Smart But Scattered and Smart But Scattered For Teens. In the mean time, check out this great article from National Center for Learning Disabilities about the 9 Terms to Know About Executive Functioning. 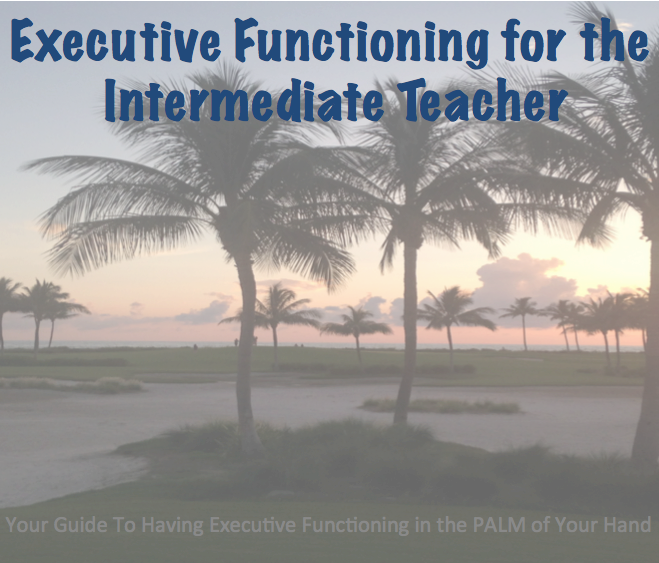 Also, check out the resource I developed for teachers on the 11 Executive Functioning traits and how to teach them in the classroom.